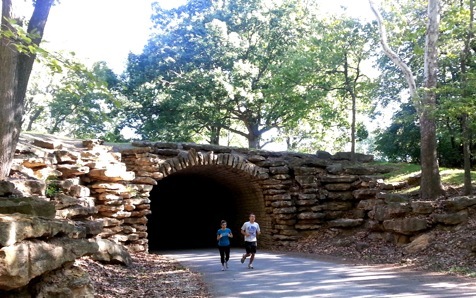 I was very excited to hear from my friend, co-worker, and twin brother from another mother, Steve Good, earlier this year that he would be starting a blog to track runners and their favorite running routes around the nation. The same day that I found out about this blog, my girlfriend and I decided that we wanted to participate in September. It would do readers good to familiarize them with one of the greatest cities in America; dare I say God’s country. Even though Ally and I both grew up in the same town, attended Missouri Western, graduated with the same degree and shared many of the same friends, we never really met until after we graduated. 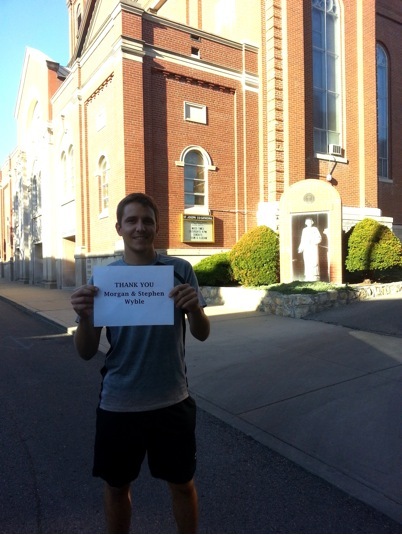 For our run, we decided to show readers our town of St. Joseph, Missouri and the landmarks that have shaped our lives both before and after we met. 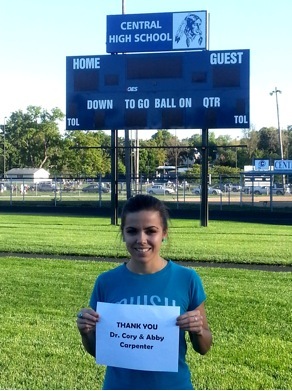 Thank you to Dr. Cory and Abby Carpenter for the memories you shared with Ally in High School. Our next stop was Wellspring Community Church where Ally and I attend a church service at 10:30ish (it really does start at 10:30ish!) 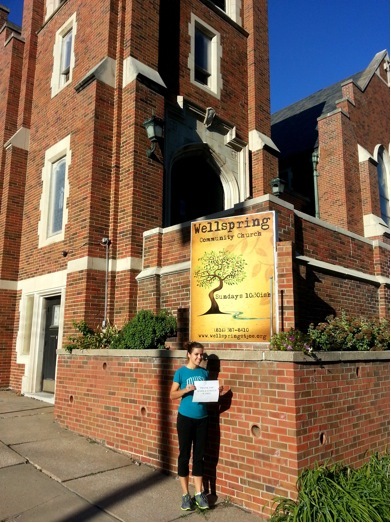 Ally has been going to Wellspring since her senior year of college. She has also served as a volunteer and team coordinator for Living Water, the non-profit organization we have chosen to donate to and that Ally will talk about later. Thank you Mark and Evelyn Wyble for raising David in a Christian home. 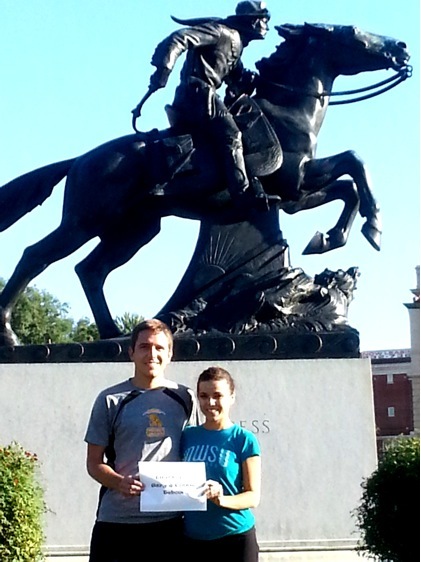 After leaving Wellspring, we ran toward downtown and the large statue of the Pony Express rider that sits at one of the large intersections in downtown St. Joe. Our town is famous for several reasons, but most notably for where Jesse James was killed and the Pony Express began. Thank you Connie and Gary Tebow for being such loving parents and a great friend. Just a few blocks up the hill from the statue we visited my home parish of Cathedral. Along with going to church here growing up, I also attended Cathedral School grades K through 8. I made many fond memories and met lifelong friends during my time at Cathedral. I have been very happy to start working close to home again so Ally and I can go to mass together where I grew up. Thank you Morgan and Stephen Wyble for your support and laughter over the years. See y’all soon! 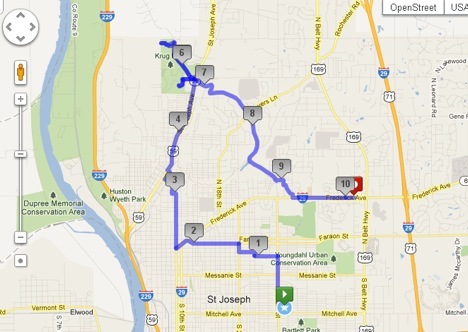 The next leg of our trip was rather long as we ran to the “North end” of St. Joe and Krug Park. If you grew up in St. Joe, or the area, you have undoubtedly hiked the trails at Krug, visited the buffalo and longhorn pens, fed the goldfish in the pond, and played on one of the many playgrounds on the property. This is a beautiful gem in the city and a great place to visit if you are in the area. There was actually a fishing derby underway while we were running past the pond and it took every ounce of self-restraint to keep from taking a break and wetting a line. Thank you Eddie and Whitney Dryer for always being great hosts and so much fun to be around. And most importantly, all of the great food. Our home stretch was our longest of the day running almost four miles to my high school. During my four years at Bishop LeBlond I played soccer, tennis, ran track, swam on our inaugural swim team my senior year, and unsuccessfully tried out for our freshman basketball team. 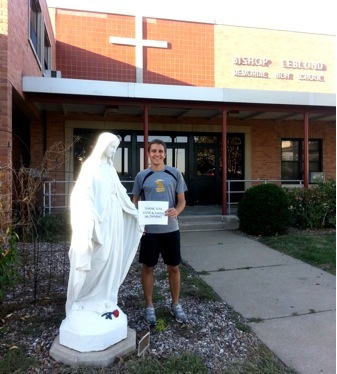 I have always loved playing sports and I credit my years at LeBlond for developing a passion for running. Although my participation in sports is more of a hobby now, I have still tried to keep up somewhat of a running schedule. Go Eagles! Thank you Steve and Dana Browning for being such great parents to Ally and for supporting the greatest school in the Midwest and possibly…no, definitely the world. At least St. Joe. The laptop has now been passed over to me, Ally. After taking David’s picture with his old high school classmate, Mary, I decided there was no way I could possibly run another 7 miles to our last destination so we called David’s parents to pick us up and take us to Missouri Western’s campus for a final picture. David and I both graduated from Missouri Western and I actually started working for the University after I graduated. I am currently the Communication and Web Coordinator for the Admissions Department. Western is located on 744 acres and our campus has had many additions just in the last few years, the biggest being the Griffon Indoor Sports Complex, which is home of the Kansas City Chiefs training camp. 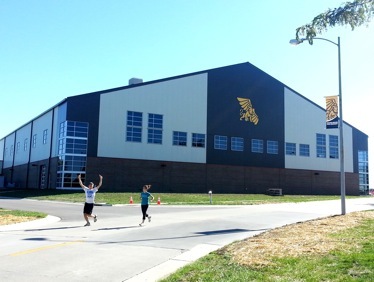 This $10.3 Million dollar facility features a full 100-yard turf indoor field, state of the art locker rooms, a weight training room for Griffon athletes and classrooms for Griffon Students. We chose to take a picture in front of the “GISC” since we are not only Chiefs fans, but Griffon fans! 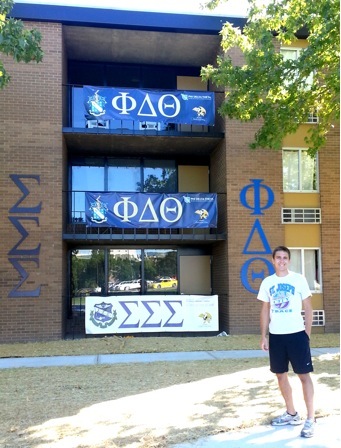 David also wanted to take a picture in front of the new Greek dorms where his favorite fraternity, Phi Delta Theta, resides on campus. Here is the bird’s eye view of our finale run. We ran 10.11 miles and rose in elevation almost 350 feet! 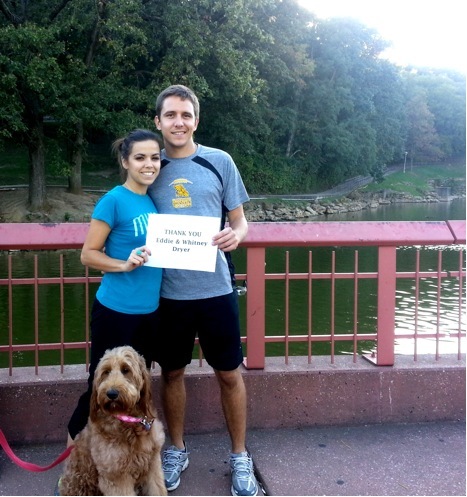 We decided that during our run we would give shout outs to people who have had a big influence in our lives. Somehow along the way we actually ended up losing a few of the signs so we need to apologize to some of the siblings and other friends who were left out. It was David’s fault. When David told me about this opportunity to show our hometown, I was pretty excited because I ran my first half marathon in April. I was also excited when he told me part of “A Good Run” was to donate to a non-profit organization. A big reason why we chose to donate to Living Water International was because in 2010 I went to El Salvador with my church through this organization. 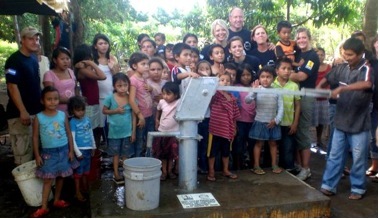 We went into a village and drilled for clean water for the people. The week was not only life changing for the people, but also for myself. I had never experienced so much poverty in my life. Before the well was drilled, the people drank from the same place where they washed their clothes, fed their livestock and disposed of waste and had to walk several miles to do this each day. Working with the Living Water team not only allowed us to provide clean water to the community, but also build relationships regardless of the language barrier. I have since returned to El Salvador to reunite with the people and also visit another community and help drill another well for a different village. Although using clean water every day isn’t something we give much thought to in America, it is a luxury 2.5 billion people don’t have access to and suffer from water-related disease on a daily basis. This has been a great time for both of us and we have really enjoyed showing you around our town and the places, people and programs that have had such a big impact on our lives. If you are ever in the area we would love to hear from you. Happy Running! Ally Browning and David Wyble live in St. Joseph, Missouri, just 35 miles north of Kansas City, Missouri. 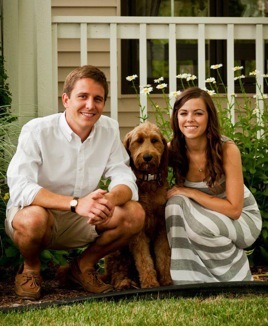 Ally and David both graduated from Missouri Western State University in 2008 and 2009 respectively both with a degree in Communication Studies. They later met at David’s 5-year high school reunion and started dating shortly after. They enjoy watching movies, spending time together with their families and going on walks with Ally’s Golden Doodle, Demi.